This is the first of the 17 murals of the Mural Mile. 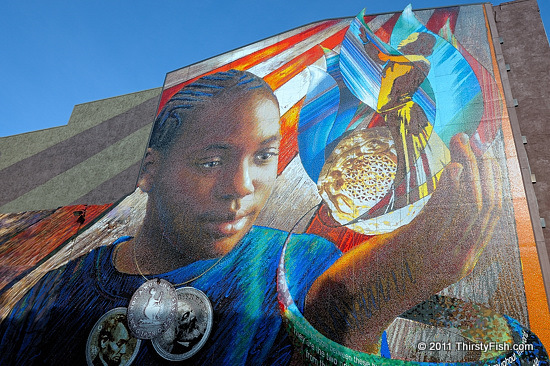 Please read the two posts introducing the Philadelphia's Mural Arts Program and The Mural Mile before you follow the photo tour. Some of Philadelphia's best Murals are not on the Mural Mile. They are found scattered in the diverse neighborhoods throughout the city. It is the eternal struggle between these two principles - right and wrong - throughout the world. They are the two principles that have stood face to face from the beginning of time; and will ever continue to struggle. The one is the common right of humanity, and the other the divine right of kings. It is the same principle in whatever shape it develops itself. It is the same spirit that says, "You toil and work and earn bread, and I'll eat it". No matter in what shape it comes, whether from the mouth of a king who seeks to bestride the people of his own nation and live by the fruit of their labor, or from one race of men as an apology for enslaving another race, it is the same tyrannical principle. You can see another photo of a mural by Joshua Sarantitis titled "Secret Book" in a prior post.